SAN DIEGO, CA – June 18, 2016 – Film Consortium San Diego announces that June 30, 2016 is now the final day to submit entries from student and professional filmmakers for the annual GI Film Festival San Diego’s Local Film Showcase. 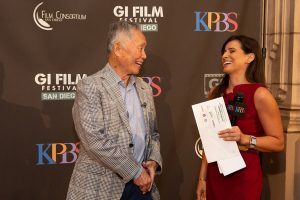 The festival, now in its second year, will take place at various locations throughout San Diego Sept. 14 through Sept. 18, 2016 and will feature films for, about, and by service men and women. The festival aims to reveal the struggles, triumphs, and experiences of the military through compelling and authentic storytelling. All major film genres will be featured including documentaries, shorts, and personal narratives. The Local Film Showcase demonstrates a commitment to San Diego’s local military community. The film must have been completed and released after January 1, 2011. Filmmakers who serve, or have served in the U.S. military, may submit a film of any genre, regardless of whether or not the film features servicemen and women. At least 60% of the cast, crew and locations to be sourced from San Diego County or Imperial County is preferred. Filmmakers interested in participating in the festival’s Local Film Showcase can review requirements and categories via the online submission form. An advisory committee that is comprised of members of San Diego’s active duty and veteran communities or are local organizations that serve military members, families and veterans will screen film submissions. The committee will then recommend films to be shown in the Local Film Showcase and to be honored at the festival’s awards program and closing celebration. Festival passes and tickets will go on sale in early August 2016. Festival organizers will announce the 2016 schedule, ticket prices, and venues later this summer. Many of the events will be open to the public with special discounted opportunities for active duty personnel and veterans. Additional information is available at gifilmfestivalsd.org.